and learn more about our award winning youth classes. Hands-on Clay Activities for All Ages! Try your hand at the Potter’s Wheel and learn how to sculpt in clay. Enter a Raffle to Win a free Drop In Clay session for 4 people. Meet our professional ceramic artist teachers who specialize in kindling a passion for creative expression. 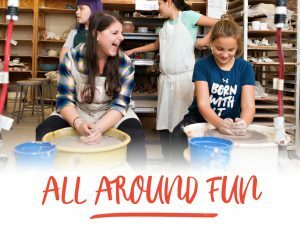 Learn about our award winning youth classes & camps and how children are rediscovering the transformational qualities of working with clay. Shop handmade, one-of-a-kind ceramic pottery and sculpture by local artists at the Shop at CAC with 10% off during Open House. Stop by for a tour of our classrooms and spend time playing with clay! For newcomers and the curious! This event will include FREE hands-on-clay activities including trying the potter’s wheel. Clay Art Center teachers & staff will be available for tours, demonstrations, and to answer your questions about classes and/or camps. Refreshments will be served and fun will be had in generous amounts.